For gardens or architectural feature the oldest prime mover still has undeniable wow factor. The mixture of movement, water and hypnotic, rhythmic sound is completely captivating ... children love them and they're great for you to just enjoy or work by. We make elegant and technically correct designs, solidly built with excellence in both traditional and contemporary style to suit your needs. All UK built and professionally installed, want something novel or ancient or different, look no further !! 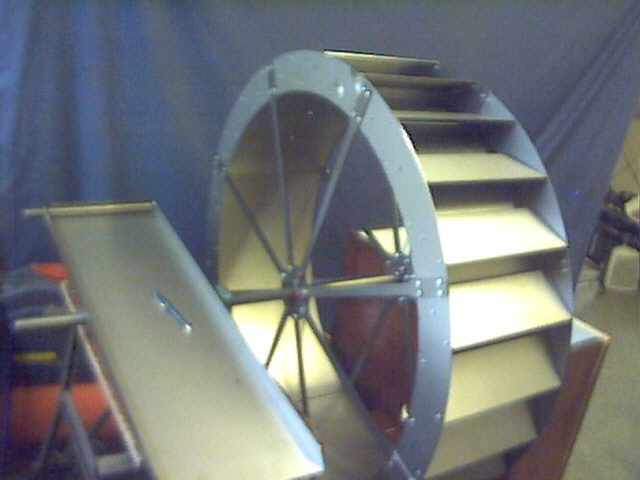 Export enquiries are also welcome..
For serious use this wheel is also perfect for powering a very wide range of low power applications yet can cope with a 100 fold flow variation and no damage to aquatic life. All wheels are made in Bedfordshire, UK. We ship worldwide and make any size or style in a wide variety of materials. 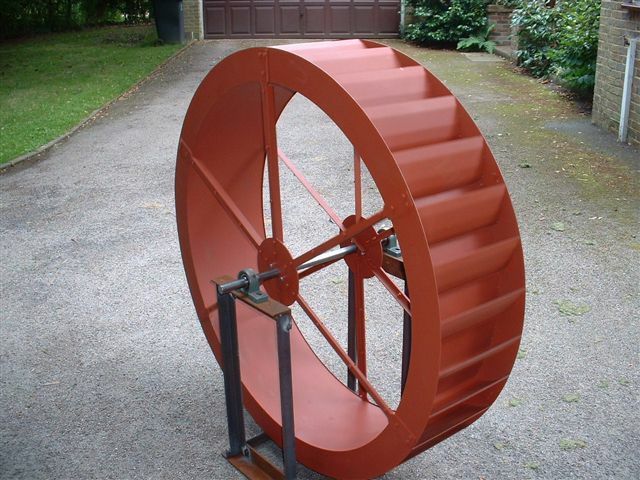 For Mr W we supplied one of our 4ft x 1ft, 30 bucket wheels, this slender design is both elegant and functional yet delivers real power from a real stream. Spring water is fed through a canal system onto the top of the wheel, the Mill building will contain an electric generator and perhaps a pump, giving many years performing garden duties and entertaining visitors of all ages. Mr Bs' beautiful 2metre diameter wheel sits perfectly in his magnificent large garden. We worked with his garden designer Paul to incorporate features he wanted to create this elegant traditional design. The project will soon be complete when the feeding flume structure, surface paving and planting are completed, pictures to follow. 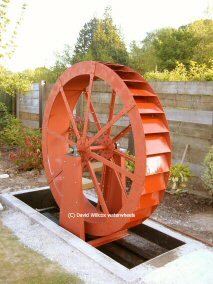 Click here to see our 4x1 award winning waterwheel set in a school playground. We've created a uniquely interactive and fun learning tool that both pupils and staff absolutely love!